06/16/13: Last Friday was a milestone at this site, and I've been so lazy here lately that I let it slip right by. 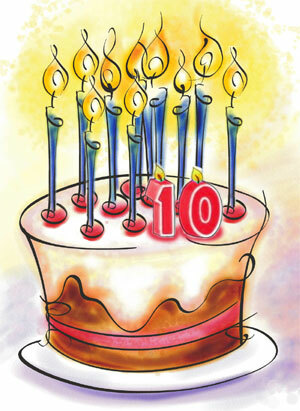 June 14, 2013 was the tenth anniversary of the first post here at stephanieandmatt.com. As you can read here, the site started as my final project for my final class of my bachelor's degree, and has expanded from there. Since then I've had over 9500 people look at the home page, which I think is pretty good for what would be called a personal blog these days. Sure, I've expanded it with some other pages like picture galleries for Stephie's art and Kisu's pictures, but it's still just a place for me to write about what's on my mind at the time. I look back and there have been some lulls when I haven't posted much. Truth is, I'm in the middle of one right now. But it looks like May of 2010 was the only month in the last 10 years that I didn't post at least one article. I'm pretty proud of that. Not much major has changed in our personal lives since this site went live, though. Stephie and I still live in the same place, Kisu is still with us, we drive the same cars, and I work at basically the same job. There have been some changes, though, and I'm not thinking about how gray my beard has become in that time. Stephie has her own web site now, artbystephie.com, and she's done several outdoor art shows, selling a few of her original pieces and many mini-prints. I've self-published two books and am working to complete the third, and I'm currently the main instigator of a writing group in North Riverside. And there's that gray hair I mentioned. But time marches on, as they say, and I think the place needs sprucing up. I haven't done anything with the design of this site since January of '04, when I made a behind-the-scenes change so it's easier for me to post things. I don't plan any major changes to the design of the site, because I still like the way it looks, but I think I'm going to take down a few of the pages in the blue bar on the left, and maybe put up a couple of new ones. I think I need to have a semi-permanent page for my writing projects, and I need to update that Safe Computing page that I have neglected for the past couple of years. I'll probably take downt he 2007 Cicada page, because we should have another visit from them next year. So if you've been reading my drivel here for the last ten years, I thank you, and ask you to check back in a couple of weeks. The place won't look dramatically different, but I hope I'll have some more stuff for you to read. And as always, thanks for looking.